The BNC connector interface is widely used in a multitude of applications despite a design that originated in the 1940s. The basic design originally offered a minimal weather protection in the mated condition and almost no protection when un-mated. Aviel Electronics, a division of RF Industries, designed a BNC bulkhead adapter incorporating a glass bead that hermetically seals the connector to withstand a 100 PSI leak test. The adapter, Aviel model number Z-1142 may be used in IP67 or IP68 applications in the mated and unmated condition. All interface dimensions are designed to IAW MIL-C-39012 specifications and overall dimensions to UG-492D/U specification. 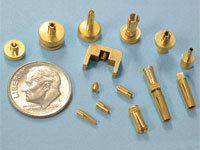 The adapter is manufactured with silver plated brass body and gold plated center contacts. The adapter is 50 ohm impedance and rated at DC to 4 GHz. with low reflection (VSWR). 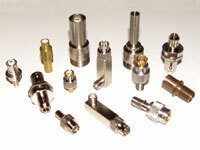 The adapter is also available in custom outline dimensions to meet customer requirements for special applications. 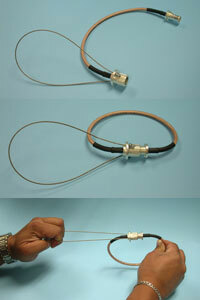 A defense contractor application required a custom SMB jack coaxial connector to be attached to a piece of test equipment. The requirement included mechanical and electrical parameters as well as a pressure seal of the connector to the panel. Aviel Electronics designed a panel mounted SMB jack with a threaded passivated stainless steel type 303 body and hex nuts. A silicone rubber O-ring design on the body seals the finished assembly for pressurization. Black polyether ether ketone (PEEK) thermoplastic polymer was utilized as the internal insulator with DuPont Teflon as the insulator for the SMB connector. The center contact is plated with mil-standard gold. All aspects of the design, manufacture and testing were performed in the United States to comply with the customers’ sourcing requirements. A military aerospace manufacturer with a custom antenna design required an RF coaxial connector that would perform in a high vibration environment. The connector’s mechanical requirements include termination onto .085 inch semi-rigid cable, chassis mounting and SSMA interface. The electrical requirements included operating frequency up to 26 Ghz. A standard chassis mount SSMA connector would meet the basis requirements, however would not perform in a high vibration environment. Aviel’s design team developed a custom connector with floating body and pin that allow both axial and radial movement while maintaining excellent electrical performance to 26 Ghz. To meet the high vibration application, the pin movement is independent of the body. Custom spring designs of Elgiloy Cobalt-Chromium-nickel non-magnetic alloy were utilized for the body and contact movements. The body components are manufactured of machined 303 stainless steel and the contact of beryllium copper with MIL-STD gold plating. An OEM manufacturer required a special SMA plug to MCX jack configuration for an over molding process to fit their custom equipment design. The SMA plug to MCX jack adapter required a non-moveable SMA end to over mold, producing an external waterproof seal when mated with a standard off-the-shelf SMA jack. The AB-SMA-JKMA-3P01 special adapter was mounted directly to their unit and molded in place. This allowed an RF electrical connection to standard ports with modified external configurations, accommodating the intent of the finished product. Most times when a standard connector cannot be used it is due to special mechanical or electrical requirements. A custom adapter offers the equipment designer allowances to produce the best device they can at a cost savings in the design approach and manufacture they have chosen. The custom adapter fills the customer’s special needs when a standard off-the-shelf connector or adapter is not available. Aviel Electronics specializes in the design and manufacture of coaxial connectors and adapters with special mechanical or electrical requirements when a standard off-the-shelf connector or adapter cannot be considered. This allows equipment designers some allowances to produce the best device they can at a cost savings in their design approach and manufacture methods they have chosen. Sometimes the most effective and economical design for a piece of equipment requires a custom adapter to function. Aviel Electronics recently designed such an SMB jack adapter. The CO-SMB-JKMA-3P01 is a panel-mount with a modified interface to allow external sealing and a .060 axial shift when mated with a standard off-the-shelf SMB plug. This special adapter allows RF electrical connection to a non-standard unit, thereby permitting the use of standard off-the-shelf RF connectors. 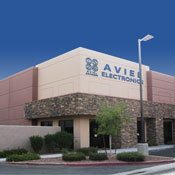 Aviel Electronics designs and manufactures custom RF connector and adapter solutions. Aviel Electronics is a division of RF Industries a leading supplier of connecting solutions provided through its operating divisions: RF Connectors, RF Cable Assembly, Aviel Electronics, RF Neulink, RadioMobile and OddCables. RF directional couplers are readily available with common interfaces such as N type female connectors. Aviel Electronics, a division of RF Industries, designs and manufactures RF directional couplers with uncommon interfaces such as the HN female shown in the photo. The HN coaxial interface is a high-voltage version of the N interface and is used in specialized applications. Other interfaces are available. Model number Z-344, shown in the picture, operates in a frequency range of 700 to 850 MHz with power handling capability of 40KW peak power (120W average power). Insertion loss is less than 0.2dB and VSWR is less than 1.1 for both the main and secondary lines. 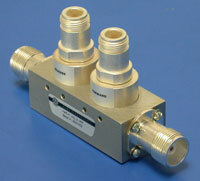 Forward coupling is 43 dB isolation. Reverse coupling is 33 dB isolation. Blindmate connectors simplify RF signal interface between devices or units that may not be in linear alignment. Standard blindmate connectors are available from several manufactures, but some applications with diverse mechanical or electrical properties require a custom design. 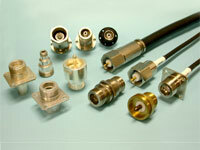 Aviel Electronics, a division of RF Industries, offers custom blind mate connectors for specific applications. General design features include a non-threaded push-on connector interface for touch-less mating. One end of the pair provide a floating, spring mounted body that moves independent of the flange mount to ensure reliable electrical contact, even with some mechanical misalignment. The blindmate pair shown offer good electrical performance up to 4Ghz with bodies manufactured from stainless steel and female contacts from beryllium copper. 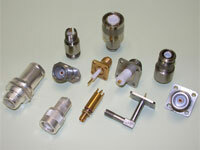 Aviel can design and fabricate custom blind mate connectors up to 40Ghz using a variety of materials and mechanical mounting techniques. As wireless electronics reduce in size, the demand for smaller components increases. 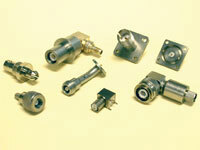 Aviel Electronics, a division of RF Industries, will design and fabricate small, space-saving connectors in various series. Available in straight, right angle, PCB mount, bulkhead mount, surface mount, snap-on, edge-mount, screw-in, press-on and solder-in configurations, these small connectors can be fabricated from brass or stainless steel and can be gold plated or passivated. With sizes ranging from SMA and below, options can include hermetically sealed connectors and non-magnetic materials. Cable assemblies can be provided to incorporate these small connectors into your system. Aviel Electronics’ Quick Disconnect Connectors with Lanyard Release disengage from each other when applying an axial force to the attached lanyard, but will not disengage when applying axial force to the coaxial cable. Our design ensures that the connectors will remain securely mated in their application until a quick disengagement is required and prevents unintentional disengagement from coaxial cable tension. With the versatility of a slide-on connector and secure connection of a standard coupling nut connector, these Quick Disconnect Connectors with Lanyard Release offer the best solution for a variety of applications. Whether you need your connector to disengage during launch or you want to reduce the setup time of connecting and disconnecting your test equipment, our Quick Disconnect Connectors with Lanyard Release is the solution. Since we custom manufacture these connectors in our Las Vegas, Nevada factory, we offer them in various line sizes, materials and finishes. The Quick Disconnect Connectors with Lanyard Release shown here have a performance rating compliant with MIL-PRF-39012 TNC connectors. The engagement force does not exceed 7 pounds and disengagement force is between. Easy on-off connectors by Aviel Electronics are designed to facilitate assembly and installation and testing of your components. Designed to mate with standard and special connectors, these slip-on configurations can facilitate installation into hard-to-reach and blind-mate locations and speed up testing in assembly line situations. 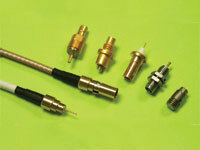 Body configurations include SMA, BNC, F, and ARINC #1 and #5, connectors are available in 50 and 75 ohm impedances. 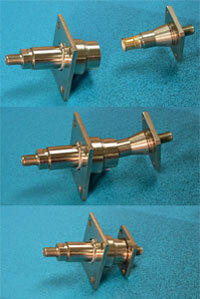 Aviel Electronics will fabricate crystal and diode holders to your specifications. Designed to hold your components securely in position, these precision-made gold plated beryllium copper components offer years of reliable service. LC and LT connectors, designed for high voltage applications while maintaining a 50 Ohm impedance, are not interchangeable. Originally designed for larger cables with jacket OD ranging from 0.50" to 0.73", these connectors can also be adapted to today's more efficient smaller diameter cables. Body configurations and materials can be supplied to meet your specific requirements. Typical performance characteristics include voltage ratings up to 5,000 volts and up to 10,000 volts with specific cable preparations, and an operational range of DC to 1 GHz. The appropriate specifications are shown in MIL-PRF-39012 or MIL-C-3650. To simplify testing, Aviel Electronics can also supply test adapters from any of the LC or LT interfaces to your desired connector configuration to simplify your testing. 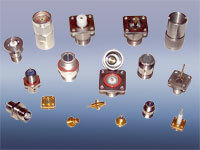 Aviel Electronics division of RF Industries can fabricate functional equivalents for most RF coaxial connectors and adapters that are obsolete, discontinued or no longer available. Available in all common interfaces, including SMA, SMB, SMC, MCX, and other miniature series, and larger interfaces such as BNC, TNC, N, C, SC, HN, LT and LC. Typical body materials include brass, stainless steel and aluminum, plated with gold, silver, nickel, anodize and olive drab. Contacts materials are brass, beryllium copper of phosphor bronze, with gold or silver plating. Virgin PTFE is the primary dielectric material with other material options available. Body configurations include straight, right angle, bulkhead, flange mount, blind-mate, tri-axial and others. Aviel Electronics designs and manufactures “unique coupling connectors” for antenna connections that require compliance with Part 15.203 of the Federal Communications Commission regulations. The connectors range from totally custom to a specific application to a modified version of a standard connector interface to a “standard” reverse polarity interface. Flange mount, crimp and compression cable mounts can be used with uniquely interfaced connector pairs to preclude the possibility of erroneous component mismating. “Coded” pairs can also be fabricated to add further uniqueness within a family of connector components. Materials used in construction are stainless steel, brass or aluminum bodies, beryllium copper contacts with gold, silver or other popular platings available. The Aviel Electronics Division of RF Industries will design and fabricate hermetically sealed connectors to handle your sealing requirements. Once the connector series and body configuration is established, the inner construction of the connector can be designed to supply the sealing required for your operating environment. Sealing can be accomplished by using O-rings, epoxy seals and glass-to-metal seals. Seals can easily withstand air pressures of 100 PSI+ of pressure and helium leak rates of <1 x 10 -8 cc/second of helium tracer gas. Applications can range from moisture resistance sealing, space applications, material detection systems, isolation of volatile materials, and altitude problems. Connectors can be supplied in configurations from small custom designs through SMA, TNC, N, SC and HN sizes, and in body configurations from bulkhead, screw-in, flange mount, and press-in designs.